For those of you unfamiliar with it, the Lensbaby is a selective focus optic that has an area in focus (called the Sweet Spot) with the surrounding area being out of focus. The original Lensbaby and Lensbaby 2.0 (now the Muse) utilized a bellows system in which the user would push or pull the front of the lens to focus. The user is also able to move the Sweet Spot of the lens, allowing for selective focus. 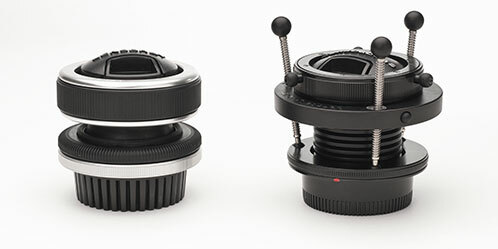 The user can also change the aperture of the Lensbaby by placing magnetic disc apertures into the lens. The next revision would be the Lensbaby 3G (now the Control Freak). Basic operation worked exactly like the two predecessors but featured a locking collar, fine tune adjustment knobs for moving the sweet spot, and a fine tune focusing ring. This gives users more control and is better suited for tripod or studio photography since the lens stays locked into position. The Composer works on the same principal of all the previous Lensbaby products but does away with the bellows. The lens now has a traditional focus ring and moving the Sweet Spot is now achieved by rotating a ball socket to the desired part of the frame. The Composer locks into position like the 3G/Control Freak, giving the photographer the ability to reproduce the same shot. The Composer is lightweight but feels very solid. The mount and upper part of the barrel are metal. This is a first because most of the previous Lensbabies had a plastic mount. The focus ring and ball tension knob have a nice rubber grip feel to them, making them easier to grab on to. The ball socket itself is plastic, but it by no means feels cheap. With the tension turned all the way down, the ball moves very smoothly and fluidly. This makes moving the sweet spot around a breeze. Size wise, the Composer is roughly the same as the 3G/Control Freak. The ball-socket design makes the barrel a little fatter but it obviously lacks the control knobs from the 3G/Control Freak. This makes it a little easier to fit into camera bags. The Composer takes a huge step forward over its predecessors in terms of operation. Some users had a bit of a learning curve with the squeeze/pull focus design of the previous models. It also required a different approach to a normal shooting technique, and focus manipulation required you to grip both sides of the camera with both hands at once. The 3G definitely improved this with the ability to lock in focus, but I’ve personally always preferred using my Lensbaby on a tripod over handholding. Until the Composer. The Composer essentially operates just like a regular lens. In a nutshell, you move the ball where you want the sweet spot, adjust focus with the focus ring, and click. By simplifying the whole selective focus process, you spend less time manipulating the lens for a particular effect and have more freedom to compose and capture the moment as it unfolds through the viewfinder. I found this to be a huge advantage and it made handholding the Composer quite simple. The disc aperture system carries over from the previous Lensbabies. For those unfamiliar: the Lensbaby optic is equivalent to an f/2 lens, with discs for apertures up to f/22 in full stop increments. There is a Magnetic Aperture Removal Tool that you use to drop in or replace the apertures with a storage case at the end of it. I was happy to see all of the apertures now have labels on them, making it a little easier to pick the one you want. The only drawback to this disc aperture system is you are essentially looking through the lens stopped down. This makes the viewfinder dark when using an aperture of f/8 or higher, which can make focusing difficult in all but bright, sunny days. However, if your camera has live view, this makes shooting with small apertures much easier. It’s also great for fine tune focusing. Along with the Composer came the introduction of the Optic Swap system. 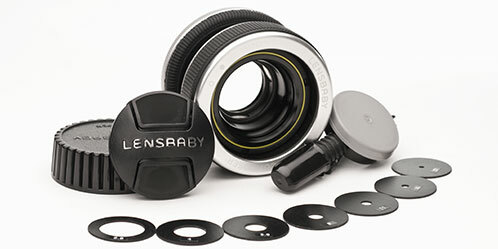 Users can now easily switch the main lens in their Lensbaby instead of having to buy another unit. Each Swap Optic comes in a small plastic case that looks very similar to that of an enlarging lens. The base of the case also serves as a tool to remove the optic from the Lensbaby. The Double Glass Optic is the default optic for all of the Lensbabies (however, there is an option to purchase the Muse with a plastic optic) and is the same optic from the Lensbaby 2.0 and 3G. The multi-coated doublet makes the sweet spot very sharp, even at the widest aperture. It’s perfect for shots where detail is important in the sweet spot. This is by far my favorite of the Swap Optics. The Single Glass Optic is very similar to the Original Lensbaby. The optic does not have any coatings so you get a slightly softer look that works very well for portraits. You can definitely achieve sharp focus in the Sweet Spot by using smaller apertures while retaining the dreamy qualities in the out of focus areas. The Plastic Optic is completely new and provides extremely soft images. Since we are talking about plastic with no coatings, it is also the most subject to aberrations and flare compared to the other Swap Optics. The results are very similar to that of a Holga or other similar cameras (minus the light leaks and frame overlaps, of course). I’ll admit that the Plastic optic is not exactly my cup of tea, but it’s ideally suited for fine art photography. This is the only one of the Lensbaby optics that does not use the traditional magnetic apertures. Instead there is a switch inside the lens that allows you to use either a zone plate or pinhole for the aperture. Both lenses have an extremely small aperture (approx. f/19 on the Zone Plate and f/177 on the Pinhole) so you’re going to need a lot of light. Both modes are a bit of a departure from the other optics because they provide an overall soft and dreamy look to the image instead of having a Sweet Spot. The Pinhole/Zone Plate was actually a lot of fun to play with. With some time and experimentation, you can produce some very unique images with this optic. For an excellent in-depth comparison of all of the Swap Optics at different apertures, check out the Optic Comparison page on the Lensbaby website. The Composer definitely lives up to the expectations set by its predecessors. It’s just as fun to shoot as the previous models and still provides the same results. I know many existing Lensbaby users love the “squeeze” focus of the previous models, but after using both, I personally prefer the new ball joint design of the Composer. I think the new design, coupled with the addition of the Optic Swap System, makes the Composer fresh enough for existing users to upgrade without feeling like they are getting the same product. At the same time, it also makes the Composer much more accessible to users who would not have considered a Lensbaby in the past. I would say if you fall into the latter category, the Composer is definitely worth taking a look at. The Optic Swap System is also a very welcome addition. It opens up new creative possibilities at an affordable price. There’s a lot of potential, and it will be interesting to see where Lensbaby Inc. takes this aspect of their system. It would be nice to see some new optics on a somewhat regular basis to keep things fresh. The Composer retails for $270 while the Swap Optics (sans the Double Glass Optic, which is included with the Composer) sell for $34.95 each or can be purchased in a three pack for $94.95. You can order both directly from Lensbaby.com or find a retailer near you.